GlusterFS: install, benchmark and optimize. Integrate applications in an elegant and agile manner. 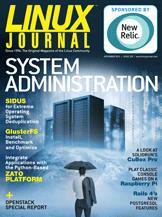 Use SIDUS in a variety of environments to provide unprecedented flexibility for both users and administrators. A look at OpenStack—the fastest-growing Open Source community in the world.